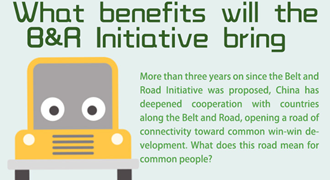 B&R FAQs: What benefits will the B&R Initiative bring? The Belt and Road Forum for International Cooperation (BRF) will be held in Beijing from May 14-15. Why does the “Belt and Road” receive so much attention? What does it mean to ordinary people? The Belt and Road Portal hereby presents a series of infographics to help shed light on all of your questions. Why does the “Belt and Road” receive so much attention? What does it mean to ordinary people? The Belt and Road Portal hereby presents a series of infographics to help shed light on all of your questions.